I have sometimes tried to downplay Amazon's rough business tactics by pointing out that they are but one retailer among many, and weren't actually a monopoly or monopsony, but it looks like I may have been wrong in certain respects. Publishers Lunch has discovered an internal investor's brief for Legardere, Hachette's parent company. The brief is an incomplete but an otherwise revealing look at Hachette Livre, Legardere's publishing division, including its operations in the US, Spain, UK, France, and elsewhere. Among other details, the brief tells us that digital made up 10% of Hachette Livre's overall revenues in 2013, and around 30% of revenues in the US in 2013. While the whole brief is worth reading for the useful insider info it reveals, what caught my eye today was one slide in particular. This doc doesn't tell us the breakdown of Hachette's print sales, but it does reveal that Amazon represents an uncomfortably large share of Hachette's ebook sales in the US and UK. 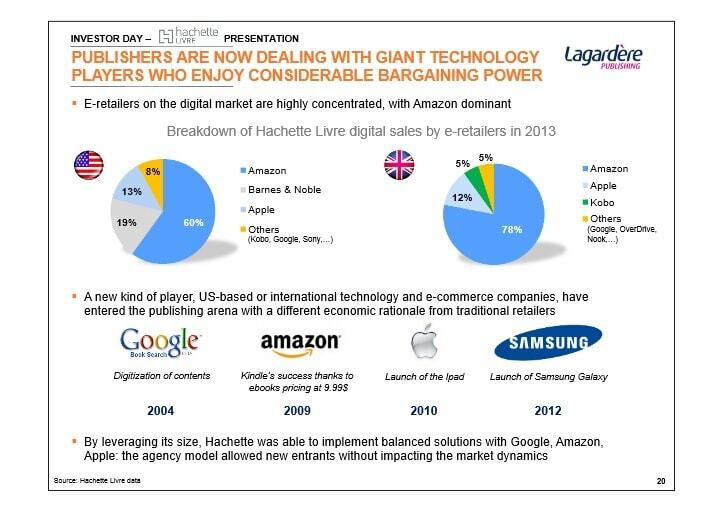 And it gives is a clue just how much control Amazon has over Hachette. I was surprised on two counts when I saw this slide. I wasn't expecting Barnes & Noble to represent such a large share of Hachette's revenues in the US, and I wasn't expecting to see Amazon monopolizing ebook sales in the UK. Due to B&N's declining digital sales, I was expecting that Apple had replaced them as the second largest ebook retailer in the US. Clearly in the case of Hachette that hasn't happened. Furthermore, even though there have been hints that Amazon dominated UK ebook sales, I had no clue that Amazon was effectively a monopoly (for Hachette, at least). On a related note, that slide focuses on just the 2 markets because the rest of the markets where Hachette Livre operates have negligible ebook sales. It's only in the US and UK that ebooks make up 30% and 27%, respectively. So was anyone else surprised to see Amazon's share of the UK market? I know that a 79% figure had been floating around, but I hadn't found it plausible. That may have been an error on my part. I don’t quite understand why anyone would be surprised by this. We know Amazon has roughly 60% of the ebook of the U.S. market. We know B&N doesn’t exist in U.K. Everyone should expect Amazon to take B&N’s share in the U.K. Network effects and all. The only thing that might surprise people is the fact that Apple just doesn’t sell that many ebooks. But they don’t. And that is no shock, either. That is why they decided to first, enforce the in-app purchase rule, and second start bundling iBooks with the new OS. Yes indeed. Many people are unaware in many markets how a gorilla often has 80% plus market share. Kodak once had 90% plus of consumer film. There are many examples. I expect B&N will get to 20-30% quite quickly with their Samsung agreement. I wish Apple could become stronger too. I find that situation surprising. Always room for two dominant players in any market. Active competitive markets need more than two or three players. Even 5-6 major players is too few. The best markets run with a dozen or so competitive players, even if a few are niche. Think: autos, where you have nine big and strong players and a dozen specialty/regional players. Agency killed a who bunch of emerging Amazon competitors and stunted Kobo and Nook’s growth. All to bring in Apple. That is no improvement. If anything, it helped Amazon because they’ve been the only player actively supporting all hardware platforms, from iOS to Blackberry as well as seriously playing internationally. Apple and Google are international, but platform-specific. Kobo is nominally international but in reality their US efforts are so half hearted the mainstream buyers barely know they exist. Anybody who thinks that an ebook world divided solely between Amazon and Apple, as the idiot BPHs seem to think, is a good thing needs to do some research. For starters, by asking the music studios what kind of “partner” Apple is. Yes the more the healthier the industry typically. Which is why consolidating down to the Big 5 reveals an industry retrenching. I was making the case about two gorillas in any market. Then several healthy monkeys and even more precarious chimps. Sometimes a chimp is a major brand trying to enter a new market where they might not belong. I encourage anyone unfamiliar with the theory of Gorillas, Monkeys, and Chimps to Google it. Lots of good stuff out there on the topic. Thanks for your posts. The problem is two gorillas chase out the chimps and then tacitly or overtly split the market. Like Apple under Jobs 2.0, they spent resources going after other markets rather than fight it out with Microsoft. Microsoft likewise, for years, went after markets where Apple wasn’t playing. It is only when they collided in mobile computing–Apple moving up from consumer toys, Microsoft moving downwards from the enterprise–that they started competing again. You can see a similar dynamic in Apple vs Amazon: on paper, they seem to be fighting tooth and nail. Apple got into ebooks, Amazon got into tablets and STBs. Look closer and you’ll find they aren’t competing so much as carving up the market between them; Apple has hurt amazon none in ebooks, Fire toys haven’t stolen sales from the iOS camp. But between them they are creaming everybody else in ebooks. Most of the small fry are history, Kobo and Google are barely measurable in the developed markets, and Sony, which never dropped a legacy product line (they still sell 60’s style transistor radios!) is getting out of ebooks. Gorillas are generally bad for consumers. Some are well-behaved, some are rogues, but they way it plays out is that one gorilla in a field of chimps has to spend time tracking all the little guys out to steal their bananas. Two gorillas tend to crowd out all the chimps and make at most token gestures of competition. One gorilla plus lots of chimps is tolerable. Almost healthy. Two gorillas back to back is just plain bad news for consumers. Thanks for your thoughts. I suppose two gorillas is better than one? But it has been my experience battling gorillas in different industries that there usually is one gorilla at the start and then another one comes along once they smell enough opportunity (they do not care about small jungles) and the two slug it out. If others can make some money as niche clearly differentiated players, good for them. I recall going from battling Kodak with their 90% film and camera market share to battling Microsoft and Google in the early days of CD-ROM mapping software (we made the first product in the category Street Atlas USA in 1991 and started with 100% market share and high prices). The interesting thing about competing against Msoft was that 20% of the market would not buy from them period. That made things much easier than battling Kodak who had nothing but customer love, as did Garmin in the GPS category. No, two gorillas is exponentially worse than one. Two gorillas drive everbody else out, whether they’re fighting or not, because there’s no place left for the chimps. I think when there are two gorillas focused on each other (Coke/Pepsi; Samsung/Apple) a smart and fast chimp or two can survive in the jungle. But they must use surprise and speed and clear differentiation. When there is just one gorilla they can more easily focus on wiping out all the chimps, although anti-trust concerns usually keep them from doing so. This is fundamentally why I am happy to see the B&N/Samsung deal because I think they will give Amazon and Apple a good run in ebooks and make for an overall more diverse new marketplace. Two gorillas may work out okay in the case of Coke/Pepsi, but that’s because they are producers. In the drinks industry, there are any number of monkeys in the form of niche soda and beer makers. They do okay so long as they are nimble enough to stay one step ahead (surprise and speed and clear differentiation, like you said). But Apple/Amazon, and the hypothetical PRH/HacMacShus pairings are two examples of middlemen. I think in this case having two gorillas would be detrimental to the industry. It could certainly be argued that Apple/Amazon did not help the US ebook market, and if trade publishing was combined into two mega-conglomerates the competition for new authors would drop through the floor. Be careful extrapolating from one BPH to the market at large. Apple skews a lot stronger towards the BPHs as a whole but there is going to be a lot of variability from one publisher to another. They might simply be weaker on Hachette and stronger on MacMillan, for example. Even on the indie side, some authors report better sales at Apple or Nook than Amazon itself. So just because Hachette has effectively outsourced their ebook sales to Amazon that doesn’t mean other publishers are that dependent. And that assumes that spread isn’t just a cherry pick. Good point. Also, B&N is the type of traditional customer that Hachette is expecting, so there’s a chance that B&N-Hachette would mesh better than Apple-Hachette, resulting in more sales at B&N. Raising the prices by 30-40 percent DIDN’T affect the market dynamics???? I snickered at that, yes. One new entrant… at the expense of several others who were squeezed out. After that chart it’s going to be hard for hachette proxies to deny Hachette is in fact trying to bring agency back. Oh, well: more ammo for the DOJ. So Nate, I have a question for you as I am not close to what is going on in NY publishing. (I left that world back in 1989 for tech.) If you were assigned to make a pie-chart showing the traditional publishing market space across the world, and break it into gorillas, monkeys, and chimps, what would it look like? Is there only one gorilla in Random/Penguin? Or are there two? How does the rest of it look. Monkeys? For instance, would all the indie publishers amount to 5% of the total sales as a collective chimp? Higher? I ask because I have no idea but thought you might. I agree with all comments about the need for many players in any business. I see the consolidation in traditional book publishing as a bad thing likely to get worse. Which is why self-publishing may save the day. Cars are a good example of a healthy industry with lots of viable options, although we almost did lose our industry recently! Beer too. Both healthy industries. I appreciate your thoughts on this. Thanks. The Big 5 in publishing function as a cartel, in much the same way that OPEC did. Btw, OPEC is explicitly modeled on the Texas Railroad Commission, which used to control enough of the U.S. oil supply to effectively set wholesale prices. Even though there were always other suppliers and cheaters within, OPEC largely controlled world oil prices for a long time. The Big 5 are much more aligned than OPEC ever was. Publishing treats authors in much the same way the oil industry treats oil fields. Extract the value and move on to the next one. The BPHs favorite pundit describes them as PENGUIN RANNDOM HOUSE and the following four, like an old 60’s musical act. The way it breaks down is that the Randy Penguin adds up to half the BPH business. So, in monkey business terms: one gorilla and four baby gorillas, with chimps disappearing left and right through consolidation. (Think: cannibal gorillas.) Once the consolidation mergers are done–in a couple years–the three surviving gorillas are going to look a tad undernourished. Given another decade, the last three will be looking more like chimps living off their backlists and a few celebrity tell-alls a year. This has happened before: look the fall of the studio system in the 50’s and 60’s. Most traditional publishers are going to end up like RKO Radio and MGM. That is a good description of trade publishers, but if you move out of that part of publishing things become more complicated. In terms of the overall book publishing industry, the Big 5 aren’t so big. Wiley larger than some of the following 4, and so is Scholastic, Wolters Kluwer, and those are just the US publishers I can name off the top of my head. I’m not surprised by these numbers. When I worked at B&N, the calls I got were why wasn’t B&N more customer friendly like Amazon. Or the other half of the calls were people that really didn’t like B&N at all, but wanted to keep them in the game just so Amazon didn’t take the whole bag. I use to call these B&N pity sales. I don’t get the whole Agency thing. I know why the claim they are doing it. But I still remember the whole big meeting with Macmillan and the other publishers going on about how we poor slobs would perceive books and their value. I just took it that at 9.99 they didn’t want my money. But at 14.99 they did. Seems to me they would sell more at 9.99. Boys, you may know a lot about gorillas, but you don’t know much about the reasons publishers need to protect book prices. Amazon uses books as bait to sell toasters. Books are not Amazon’s livelihood, as they are for publishers and booksellers. The KDP market was a brilliant idea–not to save publishing from the greedy traditionalists, just to bring in more customers for Amazon’s database. Agency pricing doesn’t kill sales, it protects the ecosystem from vultures. A not-so-secret fact: Readers pay a reasonable price for books they value. If they don’t care that much, they wait for sales or hunt for bargains among the discounts. But they *do* pay for good books. FYI, Barnes and Noble is big in the romance genre, but no one comes close to Amazon’s sales. Apple’s iBookstore is a huge disappointment. Kobo was driven out of the U.S. market by the lack of price protections and Amazon’s dominance. The gorilla is Amazon. There are no others. 1. your continued support for agency pricing. 2. you ranting about discounting while doing it yourself. 3. you ranting about self publishing platforms while doing it yourself. This sort of thinking will doom the publishing industry. Propping up prices for the goods you produce will be a boon to short-term profits, but ensures the eventual destruction of the industry. The only barrier to entry to protect publishers is their lock on the most popular authors. Agency pricing just accelerates the move towards the day when big name authors lock up their own distribution network. Wal-Mart, CostCo, etc. don’t need publishers. They need Patterson, Rowling, King, etc. But, sad to say, those folks will stop writing, sooner or later. Unless contract terms change, the next wave of big name authors won’t be signing up to be “nurtured” BPH style. Worrying about the downstream side of the equation is foolish when the real existential threat to traditional publishing lies upstream, with authors realizing they really don’t need an agent or a publisher, just fredlance editors and IP lawyers, neither of which demands a century worth if copyright control. How’s the weather in Narnia? With all due respect, the corporate publishers’ livelihood is predatory contracts and 100 years control of rights. Their whole focus on squeezing readers and authors is predicated on the outdated belief that they are indispensable. Only authors and readers are indispensable. Amazon will only remain a part of the equation as long as they offer value to *both* readers and authors. When they cease to do so, they will be dispensed with. Which is why they run a multiply-diversified business, so they won’t end up out of business come the next technology disruption. And come it will. SInce I, and I know many others who stopped buying books from the big six because of agency, I beg to disagree with this. Me and my poor slob funds went else where, bit I discovered a lot of great indies so it was good for me. It’s been four years and counting since I bought the last BPH book, print or ebook. Corporate publishers can and will be dispensed with. Not sure if you saw this news today about RadioShack and Best Buy. I would throw B&N retail into this same mix of concerns coming up soon. This only further strengthens Amazon’s share across books and electronics, or reflects their impact, which might be a better way to put it. I had not seen that, no. All of those sales of Hachette books are because *readers chose* their preferred retailer. No one lined 100 book buyers up and said “You first 60 must buy the book from Amazon, you next 19 have to use B&N, you 13 must buy from Apple and the last eight of you have to buy from whomever is left.” There are clearly alternatives to Amazon – how is it Amazon’s fault if most folks don’t want to use one of those alternatives? I don’t like Wal-Mart, haven’t even stepped in a store for over a decade, but I do not begrudge anyone their choice to shop there. Nor do I want price controls forced on Wal-Mart. I choose to shop at its competitors, and I encourage others to do the same, but as long as its negotiations with producers stay within the law I think the market should dictate whether it continues to succeed. Like other posters, I did not buy a single title under agency pricing. I have purchased some from the BPH since prices have come down but would have no problem going back to the library for those titles if anything like agency is forced on retailers again.